Caffe Roma - 526 Columbus Ave. (at Union St.), S.F., (415) 296-7942 and 885 Bryant Street (at 7th St.), S.F., (415) 296-7662. [Coffee; Artisan Microroasting]. Founded in 1989 by Anthony and Sergio Azzollini, Caffe Roma is built on the experience of three generations of the Azzollini family. Father Sergio came to San Francisco from Italy over 30 years ago to open the first coffeehouse on Columbus Avenue in 1977. Anthony was born in the United States and Roma is driven by Tony's passion for coffee - excellent coffee. Graffeo - 735 Columbus Ave., S.F., (415) 986-2420 or (800) 222-6250. [Coffee; Artisan Microroasting] One of North America's oldest artisan coffee roasters and remains a family-run company passed on down through generations. Founded in 1935 on the streets of San Francisco's Italian culinary capital, North Beach. Peet's Coffee and Tea - Numerous SF and other locations. See Store Locator. Big City Chefs: San Francisco Bay Area - Big City Chefs' staff of hand-selected, restaurant-trained personal chefs have dinner covered, whether you're looking to host a dinner party, a private cooking class, or hire San Francisco private chefs for weekly menu planning. S.F., (866) 321-2433. Cat Heads - 1665 Folsom St., S.F., (415) 861-4242. Caviar - Local delivery from favorite San Francisco restaurants. Dino's Pizza - 2101 Fillmore St., S.F., (415) 922-4700. DoorDash - Your favorite restaurants delivered to you. Eat24 - Find your favorite restaurants that deliver to you. Then order online. Farm Fresh to You - Fresh produce delivered to your home or office. Gobble - Gobble shops, chops, and delivers gourmet 3-step recipes for 1-pan cooking with zero prep required. All-inclusive price of $11.95 per meal if you order 6 or more meals and $13.95 per meal if you order 4 meals. If you are ordering 6 meals, you'll pay $71.70 total. Shipping is free for all orders. Hello Fresh - Delivers great recipes and fresh ingredients to your doorstep each week. Cook quick and healthy meals designed by nutritionists and chefs. Lasso - Wine, cheese, meat, sodas, dry goods and more delivered. Let's Be Frank - S.F., (888) 233-7265. At the Warming Hut at Crissy Field (near the foot of the Golden Gate Bride) and at Linden and Octavia Sts., across from Blue Bottle Kiosk. Luke's Local Mealbox - Prepared foods range from $5 (breakfast burrito) to $80 (family meal bundle). Delivery available in San Francisco, East Bay, and South Bay for $3.99; orders over $50 receive free delivery. Mission Chinese Food - 2234 Mission St., S.F., (415) 863-2800. Munchery - 550 Alabama St., S.F., (888) 458-5376. Postmates - They'll deliver Starbucks and grab some meds from Walgreens on the way. Pretty much bring you anything you want. Rates vary per items & stops. PRMC American Eatery - S.F., (415) 391-0420. Honest chow that's sustainably and humanely raised. From Prather Ranch Meat Co. Jump to the menu. Seamless - Online restaurant food ordering service. Browse restaurants offering service here. Sprig - Healthy, organic meals delivered in 15 minutes. TableRunner - Offers a low-commitment subscription of fresh, chef-prepared meals. When you sign up, choose either 4, 6 or 8 meals per week, and they will be delivered each Monday by dinnertime. Terra's Kitchen - Choose from 40 recipes created by their culinary team every week, they chop and deliver complete with recipe cards. These are pre-portioned meal kits, prepped ingredients with meals ranging from $9.99 per serving to $17.99 each. Veestro - 100% plant-based, organic, non-GMO, chef-prepared entrees, soups, and juices. $35 minimum food order, packages start at $99; free shipping for orders totaling $199. Zante Pizza and Indian Cuisine - Indian Pizza and Northern Indian cuisine delivered to your home or office anywhere in the city. Located at 3489 Mission St., S.F., (415) 821-3949. 5 Second Rule - Silicon Valley food writer Cheryl Sternman Rule. Bay Area Bites - KQED's public media food blog. Check, Please! Bay Area - KQED's new local series featuring regular people reviewing Bay Area restaurants. Eater SF - Also see Eater SF's Bay Area Heatmap: Where to Eat Now. Food Gal - Musings in food, wine, laughter and life from Carolyn Jung. Grub Street - Covers the San Francisco restaurant and dining scene with news about openings, closings, chefs, food trends, and more. haighteration - The lower Haight Street blog. Perfect Spot, The - Blog covering San Francisco and happenings around the Bay Area. SF City Dish - San Francisco's best bargains for great food, drinks, fun, and happy hour. SFoodie - SF Weekly food and restaurants blog. 51st State - A mobile restaurant (aka food truck) serving up American Regional Cuisine to the streets of the Bay Area. Mondays and Wednesdays: 201 Steuart St. (at Howard St.), S.F., 11:30am-2:00pm. Tuesdays and Thursdays: 253 Drumm St. (at Washington St.), S.F., 11:30am-2:00pm. Fridays: 49 Green St. (at Front St.), S.F., 11:30am-2:00pm. 620 Jones - 620 Jones St., (at Geary), S.F., (415) 614-9265 [Rooftop Bar/Lounge/Restaurant] - Chicken and waffles, baby back ribs with apple slaw, thin-crust pizza. Avital - Avital provides a behind-the-scenes snapshot of famous San Francisco neighborhoods by telling their story through its people and great food. Avital's curated culinary experiences feature the Mission and North Beach neighborhoods, as well as a Cocktail Tour in Union Square. Big Four Restaurant - 1075 California (at Taylor), S.F., (415) 771-1140. [Nightly specials may include a wild game dish, which is a specialty. Tasty varieties have included buffalo, ostrich, antelope and alligator.] 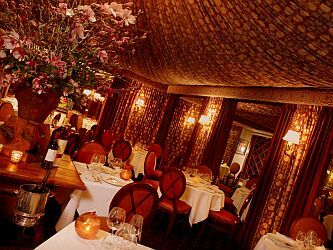 Recognized as one of the top 20 restaurants in San Francisco by Gourmet Magazine, the Big 4 Restaurant promises the finest in innovative and contemporary American cuisine. This uniquely historic San Francisco restaurant is named after the nation's four most famous railroad tycoons of the nineteenth century - C.P. Huntington, Charles Crocker, Leland Stanford, and Mark Hopkins. Appointed with lead-glass mirrors and forest-green banquettes, the Big 4 Restaurant instantly transports guests to another era of San Francisco dining and decor, with an impressive collection of original artifacts, historical photographs, and memorabilia from California's unique history. Bix - 56 Gold Street, S.F., (415) 433-6300. [Classic American]. Ambience is pure 1930s and 40s' - tasteful art moderne reminiscent of the glory of Cunard and French line ships. Blue Plate, The - 3218 Mission St.((between Fair Ave. & Valencia St.), S.F., (415) 282-6777. [American Cuisine] The garden and dining rooms are constructed from found objects, local materials and elbow grease. The comfortable interior frames the work of San Francisco artists and provides a casual venue for enjoying good food and good wine. Buckeye Roadhouse - 15 Shoreline Highway, Mill Valley, (415) 331-2600. [American/Steakhouse] Banquet/Private Rooms, Bar Dining, Bar/Lounge, Entertainment, Fireplace, Happy Hour, Late Night, Patio/Outdoor Dining, Takeout, View, Weekend Brunch. Ask for Montana Luchsinger. Bungalow 44 - 44 E. Blithedale Avenue (at Sunnyside), Mill Valley, (415) 381-2500. [Contemporary American Comfort Food; Signature Cocktails]. Burritt Tavern (Mysstic Hotel) - 417 Stockton St, S.F., (415) 400-0561. A seasonal and locally-inspired restaurant menu along with modern tavern fare including unique salads, steaks and chops. Cafe Belden - 22 Belden Place (at Bush St.), S.F., (415) 986-5673 [French]. Cafe Flore - 2298 Market St. and Noe St., S.F., (415) 621-8579. [Coffeehouse/Restaurant] The famed Parisian Cafe de Flore, known worldwide for frequent patrons Picasso, Camus and Sartre, provides the inspiration for the popular progressive coffeehouse Cafe Flore in the Castro district. A longtime see-and-be-seen hot spot, an eclectic crowd populates the greenhouse-like dining room and the lush, heated patio. Feel free to bask in the sunshine while enjoying cafe fare, lattes and espresso, or perhaps a more potent beverage from the bar. Breakfast, served through the afternoon, offers house-made granola with spiced yogurt and fruit, and spinach or chili frittatas. Lunch and dinner items include veggie burgers, a tomato-feta sandwich, and the roasted half-chicken. Weekend brunches are popular, so expect crowds and a long wait. Cafe Zoetrope - 916 Kearny Street, S.F., (415) 291-1700. [Italian] European-style cafe offering authentic Italian cuisine and a wide selection of Italian and california wines. Charanga - 2351 Mission Street (at 19th St.), S.F., (415) 282-1813. [Pan-Latin]. Fish Story - 790 Main St. (at Third St.), Napa, CA, (707) 251-5600 [Seafood]. Menu features live Dungeness crab and live Maine lobster fresh from salt water tanks, fresh fish and shellfish all sourced in accordance with the Monterey Bay Aquarium's Seafood Watch Program. Non-seafood items, as well. Foreign Cinema - 2534 Mission (at 21st St.), S.F., (415) 648-7600. [California, Mediterranean]. A 'one of a kind', nationally acclaimed restaurant combining foreign and independent films with Cal-Med cooking. Enjoy an industrial chic setting, complete with outdoor courtyard, mezzanine and full bar. Grand Cafe - 501 Geary Street (at Taylor), S.F., (415) 292-0101. [French] Set in an architecturally restored, turn-of-the-century ballroom with 30 foot high ceilings, the cafe reflects the grandeur of old Europe with touches of art nouveau and deco and exciting collections of commissioned murals, fanciful sculptures, decorative art and faux finishes from a variety of local artists. Hakkasan - 1 Kearny St., 2nd Floor (at Geary St.), S.F., (415) 829-8148. [Cantonese] Cocktails, nightly DJs and weekend dim sum. Hog & Rocks - 3431 19th St. (at Mission St.), S.F., (415) 550-8627. [Ham and Oyster Bar] Come-as-you-are bar and restaurant serving no-nonsense cocktails and modern bar food until 1AM every night. La Urbana - 661 Divisadero Street (at Grove St.), S.F., (415) 440-4500. [Mexican]. Le Colonial - 20 Cosmo Place (just north of Post St., bet. Jones and Taylor Sts. ), S.F., (415) 931-3600. [Vietnamese] Atmosphere vokes the tropical elegance of French Vietnam in the 1920s. Liberties, The - 998 Guerrero Street (at 22nd St.), S.F., (415) 282-6789. [Irish] A favorite neighborhood gathering place in The Mission featuring superb food, a great selection of cocktails and beers, an outdoor cafe and a welcoming staff. A comfortable European-style bar and restaurant. M.Y. China - 845 Market St, 4th Fl. (under the dome in the Westfield), S.F., (415) 580-3001. [Chinese] Three live-fire wok stations that face out for your viewing pleasure. Napa Valley Wine Train - 1275 McKinstry Street, Napa, (800) 427.4124. The Napa Valley Wine Train provides a relaxing three hours along a thirty-six mile round-trip journey between the historic town of Napa through one of the world's most famous wine valleys to the quaint village of St. Helena and back. Guests aboard the Wine Train enjoy the option of a freshly prepared lunch or dinner as they view vineyards and wineries from any of the vintage 1915-1917 Pullman Dining, Lounge, or 1952 Vista Dome rail cars which have been lavishly restored. Oola Restaurant and Bar - 860 Folsom St. (bet. 4th and 5th Sts. ), S.F., (415) 995-2061. [California Cuisine]. Highlights local California ingredients, seasonal produce, and organically farmed meats. Chef Ola Fendert's menu reflects his European culinary background well as his 23 years of experience in San Francisco restaurants. Plant Cafe, The - Pier 3, The Embarcadero, S.F., (415) 984-1973. [Organic] Freshly made juices, salads, sandwiches, soups, entrees and desserts. Roccapulco - 3140 Mission St. (just south of Casear Chavez St., S.F., (415) 821-3563, [Mexican] Supper club; live salsa. Rue Saint Jacques - 1098 Jackson St. (at Taylor), S.F., (415) 776-2002. [French] The menu offers delicacies such as pâte of foie gras stuffed with prunes, braised escargots, veal cheeks and Maine lobster tail. Salt House - 545 Mission St., S.F., (415) 543-8900. [Contemporary American]. 75-seat, contemporary tavern housed in an old printing press warehouse built in the 1930's. Exposed brick, original hardwood floors, 12 foot windows and oversized rusted iron girders. Contemporary American fare ranging from raw bar plateaus to house made charcuterie, appetizers and heartier main dishes. Wines from all over the world as well as custom blended wines on tap; extensive cocktail list. South at SFJAZZ - 201 Franklin St. (at Fell St.), S.F., (415) 539-39905. [Food inspired by birthplace of jazz, local wines, cocktails from the old south] Soul-food small plates like fried oysters, shrimp and grits, chicken gumbo, and alligator sausage. Tartine Bakery - 561 Valencia St. (at 16th St.), S.F., (415) 487-1600. [Bakery] Serving breakfast pastries in small batches from the oven throughout the day, hot pressed sandwiches, croques monsieur as well as pies, cakes, tarts and pastries, cheese plates. Town Hall - 342 Howard St., S.F., (415) 908-3900. [New American]. Located in the historic Meco building, there is a communal table, bar, patio, private room, and beautiful dining room. Zare Restaurant - 568 Sacramento Street (bet. Montgomery and Sansome Sts. ), S.F., (415) 291-9145. This webpage last updated on Monday, November 5, 2018 10:36 AM.